School of Computer Science students show off their final projects to industry leaders and fellow classmates in an exciting annual showcase event. 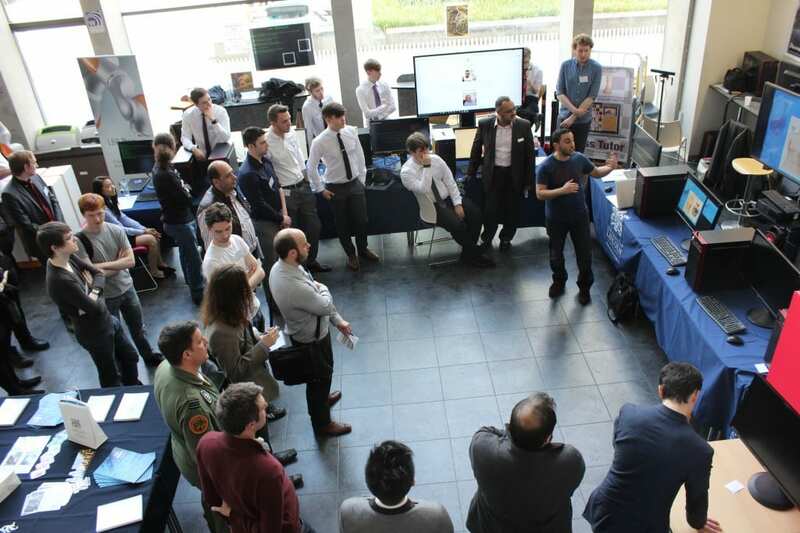 A Smart Mirror, a ‘Swords of Turing’ fighting game and chess lessons with a twist played a big part of the day-long event with undergraduate and postgraduate students in the Minerva Building, Atrium. Computer Science student Keiran Lowe said: “It’s been a really good experience and really valuable, because even though our project is in development, people who try the game have given us responses we might not have thought about. And because we have to programme each response in, we can add their responses to increase the knowledge base. Even Gadget Show presenter and University of Lincoln guest lecturer Jason Bradbury came along to see the projects in action. Jason helped students with ideas, encouraging projects to go further and promoting team work from start to finish. Organiser Dr Amr Ahmed said: “This is another success and expansion over the last 4 years events. More guests and interests, better projects and demos, all made public in the Atrium for internal and external visitors. University Vice Chancellor, Professor Mary Stuart enjoyed the day too, adding: “What a wonderful event and so good to see all the work.